Hailing from Padua in the north of Italy, Chef Francesco Colore joined the Kempinski Hotel San Lawrenz in 2006 after spending 5 years at the Kempinski Hotel Bahia Estepona Costa del Sol in Spain. He took time from cooking to join me for an interview during my stay at the hotel in June 2007. One of the many things that he is enjoying about his position at the Trattoria San Lawrenz is that he always likes learning something new. He likes making use of the hotel's organic herbs and vegetable garden, where he has a plethora of herbs to use, along with rucola, baby sweet corn, lettuce, and tomatoes in his recipes, and changes his menu seasonally. 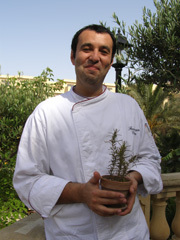 Gozo is an island, so he said that he enjoys having the opportunity to use the freshest of fish. When it comes to Gozian goat cheese, he said that the fresh goat cheese is phenomenal. There are three types of Gozian goat cheese, one type is aged in the sun under a net, another type is fresh goat cheese with a black pepper crust, and the third type is plain fresh goat cheese. After sampling all three of the cheeses, I readily agree with him as to the quality and taste of these exceptional cheeses. Although he began his career as a pastry chef, he enjoys working as a savory chef, because he replied, "In the kitchen, there is no limit." Method: Dry the cheese and remove excess water. Leave on a perforated try while you mix the other ingredients together into a spreadable paste. Place the mixture on top of the goat cheese, and then heat under the salamander (or broiler). Method: Make a puree of the banana and add the ground spices. Grate the apple and add to the banana mixture and cook until the apple is tender. Beat the butter and the sugar together, and slowly add the eggs. Add the flour and the baking powder to the banana mixture, and then mix in the butter mixture. Pour in a mold and bake for 15 minutes at 175° C (350° F). Method: Mix all of the ingredients together except for the celery. Cut the celery into a small stalk. Pour the Bloody Mary into a shot glass and garnish with the celery stalk. 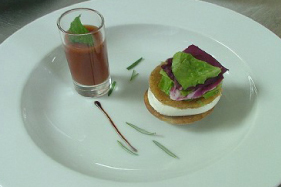 Presentation: Place the pudding in the center of the plate, and place the goat cheese on top of the pudding, with the Bloody Mary Shooter on the side. Garnish with marinated carrot shavings and fresh herbs. Method: Thinly slice the aubergines, and marinate them with garlic and parsley and grill on a flat grill. 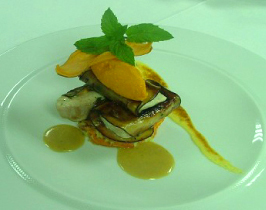 Filet the amberjack, season well, and place the grilled aubergines on the filet, sprinkle with marjoram, and roll. Place on a flat grill and sear all sides. Continue cooking in the oven, and when cooked, roll in cracked pepper and fennel seeds. Method: Peel and thinly slice the carrots, smoke and mix with the rest of the ingredients. Bake in a buttered baking dish. When the carrots are tender, remove from the oven, cool, and cover the carrots closely and set a plate on them to weight down the carrots, (so they will not break when cut) and refrigerate. Method: Fry the shallot in 25 grams (1 tablespoon + 2 teaspoons) of the butter, add the tarragon, and then reduce with the vinegar until the reduction equals 2 tablespoons. Beat the egg yolks, add the vinegar, and gradually add the melted the butter. Whisk it until it is firmer than a Hollandaise sauce. Presentation: Fill a plate with the Champagne Butter and place it under the salamander (or a broiler) until it turns light brown. Place the dauphinnoise in the center, top with 2 filets, place 2 vegetable wafers in between and drizzle with the Manzanilla butter in between. Method: Lightly whisk the egg yolks and sugar together. Bring the cream and the milk to a boil, and then add the lime and ginger. Pour the cream mixture into the egg yolk mixture, mix, and pour into ramekins. Set the ramekins in a bain-marie, (water bath in a large enough pan to hold the ramekins), fill the pan partway with water, cover, and bake at 155° C (300° F) until set. Method: Cut the banana slices and place them on a tray and smoke them for about 15 minutes. Place 2 slices in each of the ramekins. 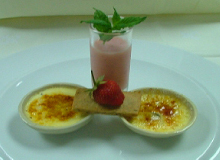 Prepare the brûlée the same way as for the Lime and Ginger Brûlée. Method: Beat butter and sugar, and then add the egg yolks, vanilla, golden (maple) syrup. Add the flour and crushed pecans and beat. Cover a baking sheet with parchment paper, put the cookie dough on the baking sheet, and cover with another piece of parchment paper. Place a baking sheet on top of the parchment paper to flatten the cookie dough. Refrigerate the dough overnight. Cut the dough into pieces 9cm long x 4 cm wide x 0.5 cm thick (3.5 inches x 1.5 inches x ¼ inch. Bake at 180° C (350° F) for about 10 minutes or until the cookies are golden brown. Remove from oven, let cool on a rack, and serve. Method: Combine all ingredients together. For information on the Maltese Islands, please visit: Malta Tourist Authority, www.VisitMalta.com, Heritage Malta, www.HeritageMalta.org.